Well not quite cheesecake, but pavlova was the key award of choice as our newest Alltraders team member BJ recently celebrated receiving his Official Australian Citizenship. 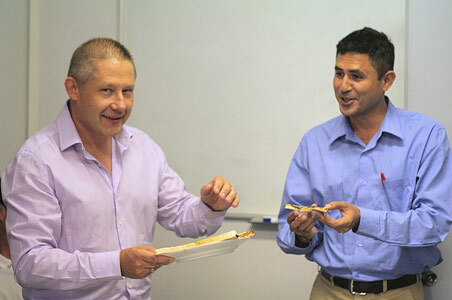 Work stopped for a moment to mark the occasion and hear BJ's speech on his impressive history, followed by the presentation to Birendra of a large pavlova (from the Cheesecake Shop), together with perhaps the most iconic edible Australiana goodies - a platter of Vegemite. One of our managers, Vic presented BJ with the goods, which were thoroughly and enjoyably consumed within a short space of time. From everyone at Alltraders, we congratulate you, BJ! 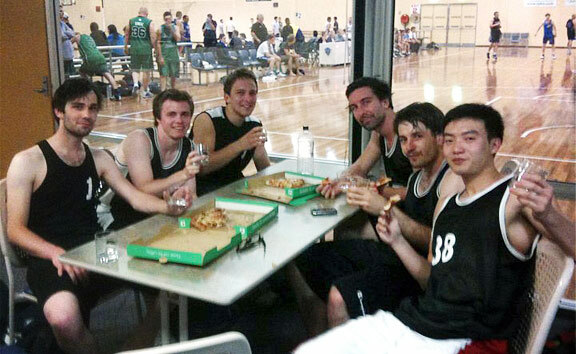 Aside from producing spectacular results on a daily basis at Alltraders, staff members Cohen Gum, Michael Garratt & Ben Zhang also managed to take home gold in the Wayville basketball finals Tuesday night. We can ignore the fact that it was E grade basketball with only the bottom 3 teams playing off for free pizza and an amazing glass cup. This is in no way a good representation of the first class skills that were put on display. After a shabby season, once again The Sinking Drinkers became pressure conquering, cold stone killers during finals. Demoralising their competition at both ends of the court, tripling their score and remaining completely professional as their opponents spiralled into dissent. The team managed to secure their second shiny cup in 2 successive seasons. Nice work guys. From left to right: Corey Michael, Michael Garratt, David Michael, Pete Michael, Cohen Gum, Ben Zhang. The Tour Down Under has been run and won, and Alltraders' Sponsored rider Jeremy Rees tells us about his ride. The tour went pretty smoothly, and there were no problems with my bicycle. The start was really slow. When it was time for riders to start riding (at the end of the countdown), I had to wait about 20 minutes before I could start pedalling normally as there were lots (maybe thousands) of cyclists in front of me. I noticed some traffic that had to wait a while (perhaps a long while) to let the cyclists pass. I felt a bit lonely the entire time as I rode by myself. I could have rode with some people that I knew, but regretfully, it did not happen. It was very windy, which made the ride a bit harder. I enjoyed the climbs; none of them were very difficult. I think my top speed was 59km/h on the final descent to Strathalbyn. Alltraders utilise a diverse range of skills & experience to produce highly functional, user friendly, custom web-design-development solutions. Successful products include engineering web-design-development for house & shed design, digital signing & stamping of PDF documents, & custom extensions for the Joomla! CMS community. If your business has an online presence, why not instantly convert your local and international audience to clients by including an online shop? Alltraders can add eCommerce to your existing website, or help you redesign your website around the shop. Having a website represents the public face of your brand, and replaces your traditional shopfront. Is your website open and online 24/7? Alltraders web hosting provides the systems, staff, skills and backup to ensure your website’s accessibility. Read on about the performance, security and management benefits of hosting your website and domain/s with Adelaide Websites. Q&A - A Fact Finding mission to make sure we see your business the same way as you do and to make sure that the work we create represents your business well. Design Brief - Probably one of the most important parts of design. If there's no brief we would have no direction. Initial sketches & ideas - Once we have a design brief we can move onto researching, brainstorming & sketching initial ideas. We look at client competition, market trends and other influences that will form the end result. Working up a chosen route - After an initial sketched idea has been singled out, we then proceed to the computer and start designing and art working your logo using industry standard software. The logo will then be presented. Presentation & Feedback - At this stage we would ask for you – the client – to consider the presentation and give us feedback taking into consideration the design brief and the initial Q&A. Amends/Revisions - Any revisions will be carried out following feedback and the identity artwork will be finalised and supplied in various formats. The Adelaide based web design and software development firm Alltraders will sponsor Jeremy Rees in his upcoming ride in the 2011 Santos Tour Down Under. Jeremy will be taking part in the Mutual Community Challenge, the 4th stage of the cycling race, where amateur cyclists have a chance to ride alongside such names as Stuart O'Grady, Robbie McEwen and Lance Armstrong. Starting early on Friday the 21st of January, the 124km stage sees competitors climbing over a 500m range of altitudes, and will wind its way from the Eastern Adelaide suburb of Norwood, through the towns of Gumeracha, Balhannah, and Macclesfield to Strathalbyn. Last week twelve men aged from 24 to 50, gathered for breakfast at a quiet restaurant in Glenelg (a lovely beachside suburb of Adelaide). From the outside it wouldn't have been clear why we were there and if you saw some of our backgrounds it may have confused you more. There was a retailer, an educator, a council worker and ex-civil engineer, an entrepreneur, a couple of graphic artists, some software engineers, a project manager and a keen interstate social networker. Aside from sharing breakfast there was a lot in common. Alltraders invited this disparate group of people together for several reasons. Firstly it was to spend some more time with a visiting international speaker and Joomla! enthusiast, Andrew Eddie. Secondly, it was to eat a nice brekky. Thirdly it was to promote the best website content management system in the world and lastly, it was to get to know others who know what Joomla! is and what it can do. Suffice it to say, the food was good, the company was better and it was a really good time to get to know others who use Joomla! Adelaide business website specialist Alltraders has made online marketing activities quicker and simpler for Adelaide-based young business group, Gr8 Business Connections. Gr8 Business Connections is a group for business owners, managers and business intenders aged between 18 and 35 years old. As well as providing opportunities for young business people to meet other young business people, allowing them to share stories and build business prospects, the organisation delivers information and assistance on upcoming programs, resources and events. Founded in 1996, Alltraders uses the Joomla! Content Management System to design and deliver easy-to-use websites that substantially reduce the cost of maintaining a website while increasing its effectiveness in achieving business goals. Alltraders has sponsored Gr8 Business Connections by developing and hosting its website at www.gr8bc.com.au, using Joomla! to make it quick and easy to manage. The two key Alltraders team members in this Gr8 project were project manager Jared Green and web designer Michael Garratt. "Looking for someone to build a quality website is not an easy task, especially when your own knowledge of programming, designing and coding are almost nil. The website I wanted built was going to be extremely complex as it required customers to fully design and purchase everything online themselves...not a simple task when it's a totally unique product concept so everything is original and started from scratch! The team at Alltraders are undoubtedly qualified to design and build top quality websites. They consider all aspects... visual appeal, functionality and 'back-of-house' usability. I encourage you to take a look at www.fotoball.com.au and see for yourself. The site required an enormous amount of specialist work that no other website building company I talked to would even know where to start. Since the site went live in September 2009 I have had many comments about the site from local and international viewers. I'd be happy to recommend Alltraders if you are looking for a competitive edge online."